The River Thames is 346 km (215 miles) long from Gloucestershire to the North Sea. It is a tidal river from the Thames Estuary to Teddington. Upstream of Teddington, the river is controlled by sluice gates at a series of weirs. It is thought that people have lived along the Thames since the Neolithic period (about 10,000 BC). 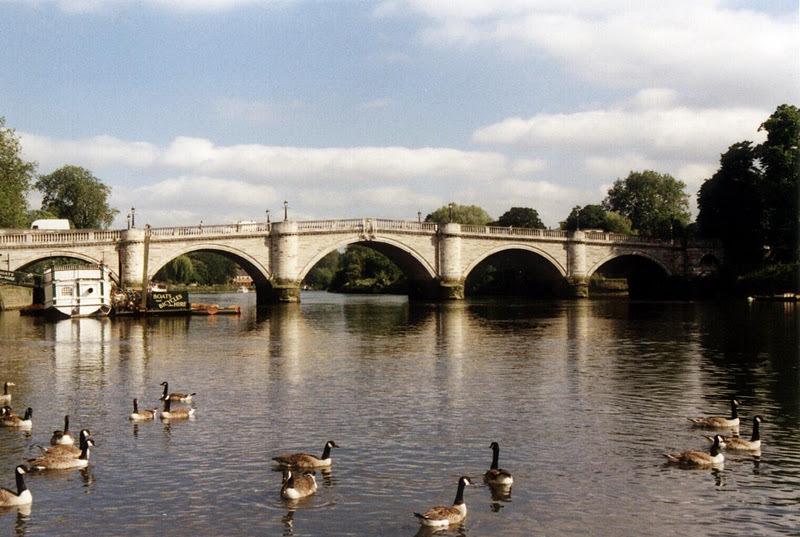 The Richmond Bridge is a couple of miles downstream from the locks at Teddington. It has been captured by many artists including in three paintings by J. M. W. Turner. It was built in 1777, making it the oldest surviving bridge on the Thames (it was widened in 1937). It is a five span, closed spandrel stone masonry arch bridge. It is 90 m (300 ft) long and varies between 7 m (24 ft) and 11 m (36 ft) in width. When the bridge was widened, the stones were carefully removed, stored, and put back on the widened bridge. Since the bridge is still rather narrow, most of the traffic takes the nearby Twickenham Bridge (built in 1933) onto a busier thoroughfare and sparing the old town of Richmond. Thames River Bridges: Richmond Bridge by Mark Yashinsky is licensed under a Creative Commons Attribution-NonCommercial-ShareAlike 3.0 United States License.